Bonifacio passenger and car ferry ticket prices, timetables, ticket reservations and information for ferries sailing from Bonifacio to Santa Teresa. Compare all available Bonifacio ferry ticket prices in real time and book the cheapest available Bonifacio car and passenger ferry tickets sailing to and from Bonifacio, Santa Teresa with Moby Line Ferries ferries online with instant confirmation. Book Bonifacio Ferry Tickets with Moby Line Ferries for ferries sailing from Bonifacio to Santa Teresa online in advance to enjoy the cheapest available ferry ticket price. The price you see is the price you pay. There are no hidden extras or surprises such as added fuel surcharges or booking fees and we do not charge you anything extra for paying with a Visa Electron card. The price we quote you for your selected Bonifacio passenger or car ferry ticket, onboard accommodation and vehicle type is all you will pay, and that's a promise. To obtain a Bonifacio ferry ticket price and book your ferry ticket securely online please use the real time ferry booking form on the left. You are also able to add a hotel at your destination, or anywhere else, to your ferry ticket when completing your ferry ticket reservation. Bonifacio is a star attraction in Corsica, drawing visitors from all over the island and overseas to marvel at its medieval houses precariously teetering on the edge of the imposing limestone cliffs. Bonifacio's Old Town, with a labyrinth of narrow streets and historic buildings, was built by the Genoese and is a fascinating place to wander around. Founded in 828 AD by Count Bonifacio of Tuscany, it's natural harbour bears a striking resemblence to the home of the Laestrygonians referred to in Homer's Odyssey of the 7th century BC. Bonifacio enjoys a superbly isolated location at Corsica's southernmost point, a narrow peninsula of dazzling white limestone creating a town site unlike any other. The much-photographed haute ville, a maze of narrow streets flanked by tall Genoese tenements, rises seamlessly out of sheer cliffs that have been hollowed and striated by the wind and waves, while on the landward side the deep cleft between the peninsula and the mainland forms a perfect natural harbour. A haven for boats for centuries, this inlet is nowadays a chic marina that attracts yachts from around the Med. Separated from the rest of the island by a swathe of dense maquis, Bonifacio has maintained a certain temperamental detachment from the rest of Corsica, and is distinctly more Italian than French in atmosphere. the town retains Renaissance features found only here, and its inhabitants have their own dialect based on Ligurian, a legacy of the days when this was practically an independent Genoese colony. Such a place has its inevitable drawbacks: exorbitant prices, overwhelming crowds in August and a commercial cynicism that's atypical of Corsica as a whole. However, the old town forms one of the most arresting spectacles in the Mediterranean, easily transcending all the tourist frippery that surrounds it, and warrants at least a day-trip. If you plan to come in peak season, try to get here early in the day before the bus parties arrive at around 10am. The most vivid view of Bonifacio is from aboard a boat in the sapphire-blue Bouches de Bonifacio (Strait of Bonifacio). This stunning 12km strait channels between Corsica’s southernmost tip and the Italian island of Sardinia. From the water, the tall, sun-bleached buildings of Bonifacio’s citadel appear to morph seamlessly into the serrated white limestone cliffs rising up from the sea. Within the clifftop citadel is a charming maze of alleyways with a distinct medieval feel. A sheer 70m below, on the northern side, is Bonifacio’s vibrant port, which spills over with café terraces, shops and – as Corsica’s most visited town – more than a few tourists in summer. Several notable sites can be seen in the town, including the 'Staircase of the King of Aragon' cut into the stone to reach the old town above; the monument to the dead; and a sprinkling of attractive churches among the medieval buildings. The town is a major centre for sea based leisure activities sich as yachting and diving. Be aware that the success of the yachting is partly due to the fact that Bonifacio is one of the windiest places in France! Note that all this excess of activity and pleasure does mean the town gets rather busy in the summer months - not unusual in many of the towns in Corsica - but it is still highly recommended. The Lavezzi Islands, a designated marine preserve, are just off Bonifacio and can be visited by boat. The prehistoric sites at Filitosa, Casteddu de Cucuruzzu and Palaghju provide an interesting insight into Corsica's long and colourful history. The cafés around the port are an excellent place to watch the world go by, and there are numerous restaurants. There's also a tiny but interesting aquarium on the port which children and adults enjoy. Walk or take the tourist train from the port up to the old town at top of the hill. Look over the wall here and you'll see the grain de sable, a massive chunk of limestone cliff that's fallen into the sea, which is the subject of thousands of postcards. The steps here seem never-ending but do lead down to a tiny scrap of beach where you can then turn left to start the clifftop walk. Alternatively, you can drive up to the old town and leave the car in one of the car parks by the cemetery. From here it's a flatter walk into the old town, which is a delightful place to explore. The view from the cliffs is superb. You can visit the churches and ramparts with narrow streets full of shops and cafés. The marine cemetery at the far end of the cliff top by all the car-parks is much visited as it's full of extraordinarily elaborate mausoleums. Heading north up the coast from Bonifacio is a series of spectacular sandy bays, all breathtaking in their natural splendour. The closest being the hamlet of Santa Manza, set 10 kilometres east of Bonifacio. With a family friendly beach and a gently shelving shore it is perfect for children and popular with watersports enthusiasts, particularly windsurfers due to the favourable winds. Rondinara is a natural formed horseshoe bay with fine white sands which slope gently into the turquoise waters. A simply stunning beach, it is flanked on one side by pine trees and a protected nature reserve on the other. Best Price Guarantee - We always offer you our lowest available Moby Line Ferries passenger and car ferries ticket price to and from Bonifacio. There are no hidden extras or surprises such as added fuel surcharges or booking fees and we also we do not charge you anything extra for paying with a Visa Electron card. The price we quote for your selected Bonifacio ferry ticket, onboard accommodation and vehicle type is all you will pay, and that's a promise! In the unlikely event you find the same all inclusive Bonifacio ferry ticket cheaper in the brochure of any other tour operator we promise that we will do our best to beat that price or offer you the choice of requesting a refund. 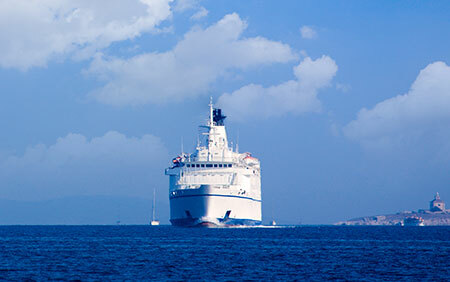 To book Bonifacio car and passenger ferry tickets please click here. At ferryto.co.uk you are able to obtain live Bonifacio ferry ticket prices, check availability and book car and passenger ferry tickets to and from Bonifacio at our lowest available ticket price. Ferryto.co.uk is part of the world's largest online ferry ticket distribution network providing the ability to book over 80 major European ferry operators including to Bonifacio and to over 1,200 other ferry routes throughout the UK, France, Spain, Ireland, Holland, Eastern Europe, the Mediterranean, the Baltic and North Africa.